Sorry to be a little MIA lately, we were out of town at an Aggie game all weekend and then I had two days of field work down south so I’ve been a bit behind on the blog front (and a bit cold everywhere!). But to make it up to y’all, today’s post is an awesome one… I have been soo excited to share this event with you guys and it’s finally here! All this week, myself and 24 other blog friends are sharing gift guides and then GIVING AWAY one of the items on our guides! Every day at 8am a handful of us will have a gift list and giveaway open for one week. All kinds of lists; things for a DIYer, things for a hunter, things for the whole family, things for friends, big-ticket things, little-ticket things, stocking stuffers, everything! So hit up the links at the end of this post to see what the other girls have in store this week! Not only this one, pretty much any of them, they’re all so cute and comfy! Super cute earrings, necklaces, bracelets, and rings from super awesome folks up in super awesome Austin, Texas. You saw me show off my necklace here and here which I seriously wear all.the.time. It is so hard to find work/garden gloves that fit women’s hands well, and so frustrating to use ones that don’t when you can’t find any. I found Ethel gloves (Mechanix women’s now) a few years ago and am totally spoiled now. I have three pairs and they last forever. Ok, I asked for a pair of Frye riding boots for Christmas (long shot, I know) but I keep seeing the cutest booties around too, they go with anything; dresses, jeans, and shorts! Give her something to cruise around the neighborhood in style on! Yes, Electra is THE cruiser brand to have and I have loved them for years, but there are alot of other more reasonably-priced brands that are also great. I have a sixthreezero myself (but soooo wanted an Electra!). In case there’s someone you know that hasn’t grabbed this gorgeous Nate Berkus bowl, it would make a cute gift that she can use almost anywhere. Score some brownie points with these romantic statement pillow shams. They also come in tan, pink and blue. Since the husband always grabs my cozy throws, I am always wanting to get me more and these PB cable knit and fur ones are at the top of my list. You can’t get any better than a sweater AND fur throw! If she loves home decor, give her a little eye candy and reading material. Actually, I need to subscribe to this myself! Dwell is also a really beautiful mag too. Everything tastes better when it’s made in one of these, it’s a fact. This is probably the best thing I registered for and it may be on the list of things I take with me when we have to evacuate for a hurricane. Probably one of the funnest kitchen gadgets. I use mine for soups and thought this minty blue one is really pretty, they have a ton of other colors too. If she’s as messy as I am in the kitchen, clothes are common collateral damage and are sometimes total gonners from spills. I need to get an apron and thought this one was really cute, not too hokey, not too grandma, and not to bright and crazy. This guy is also crazy versatile and can do so much for just $99. A big stock pot for large quantities of liquids, a big strainer to boil and drain large amounts of noodles, potatoes, and veggies, and a small strainer to steam all of it too. I use mine all the time. My feet are freeeeezing as I type this so these are on here because every night I wish I had some! Um, no explanation needed here. Sooo, see that pretty little number up there as #2 in “For Her”?? I don’t know any lady that wouldn’t need some beautiful jewelry and y’all have heard me rave about Ornamental Things so much on here, that they have totally hooked one lucky reader up with a $50 gift card for ANYTHING on their site!! Necklaces, earrings, bracelets, rings, whatever you want to pick for her or whatever your girl wants to choose for herself! Make sure and visit all the other bloggers’ posts and giveaways this week! FANTASTIC giveaway prize!! So many gorgeous pieces of jewelry to choose from!! Oh I would love any of the Jewelry, is all gorgeous! 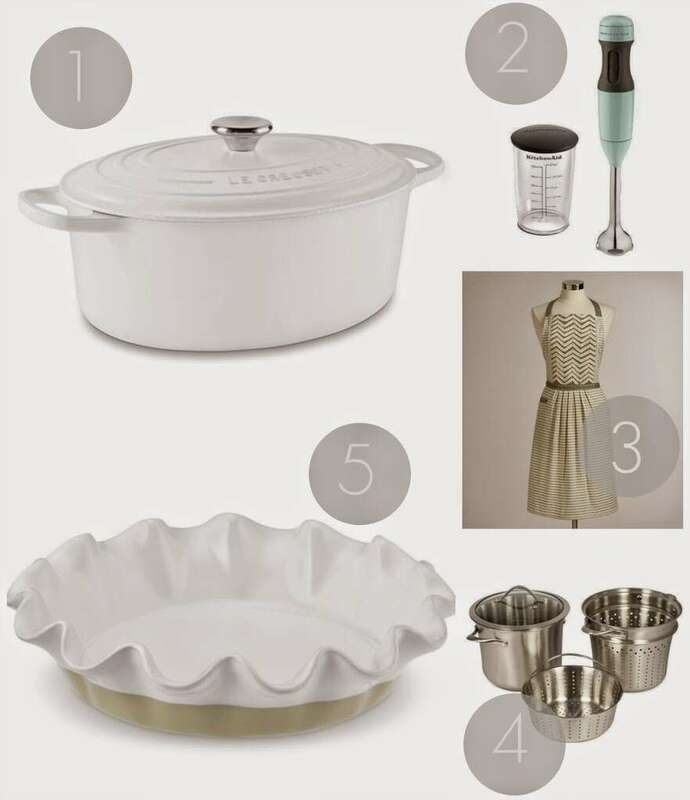 Love all your gift guide ideas, going to have to add some to my list! You have great style! Your wish list/gift selections are superb :) And the jewelry is stunning… would love to win that! You’re super sweet Erin, thank you! LOVE this!!! Fabulous gift guide AND giveaway!!! I love the filigree bracelet!!! Me too, love that one! I am loving those cozy boot socks and the dutch oven from Le Creuset! 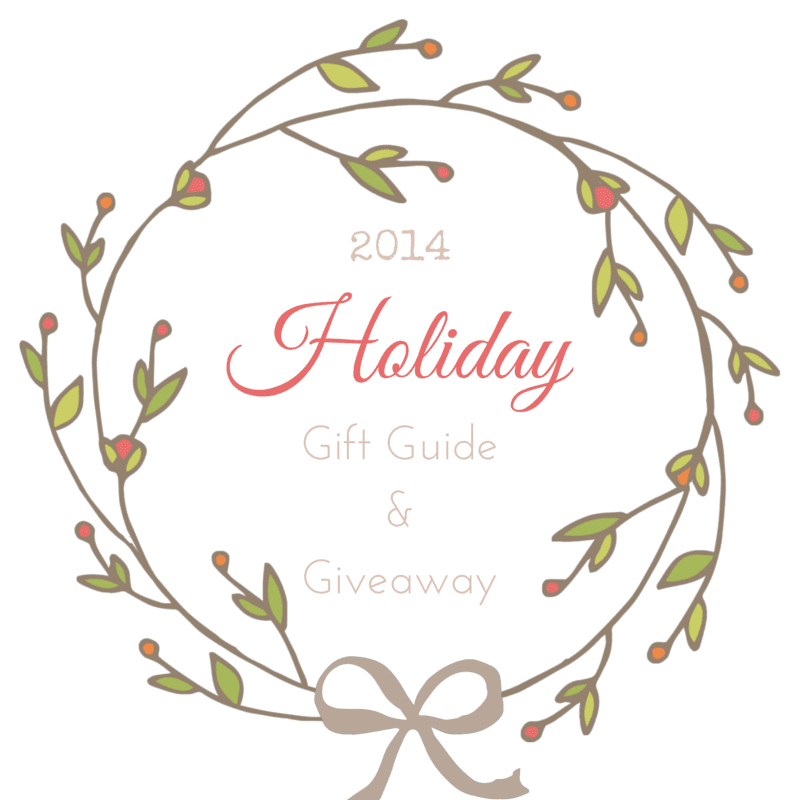 Great gift guide and giveaway! So many pretty things! I love the state necklace and the telescope necklace. I would get the state necklace! I LOVE the Octagon Blue ring! Yes! It is super cool!! I like the Octagon Green Ring! Those pieces are so pretty, they’d go with anything! I like the arrow necklace! I so almost got that one last month! I love the crafty necklace and the filigree heart necklace and the filigree cuff bracelet! It is hard to pick! The sun sparks is such a statement piece isn’t it?!? It’s gorgeous! Love the jewelry, especially the state necklaces. Great gift guide, too! They are so cute :) Thanks Katie! I am a bracelet lover. A girl can never have too many bracelets! I’d probably spend the whole $50 on myself if I won! OOOOOOH great gift list and great giveaway! If I won I would get the blue lighthouse necklace! Everything is beautiful! I like the flying owl necklace! Emily… you had me with the boots! Dude, all of their boots are so awesome. I’ve wanted some for years! Awesome gift guide!! I love that gold wing bowl. And, I’d TOTALLY get that necklace you have as number 2!! Love it!! I still REALLY want that one too! It’s one of my faves too Kiersten! I would choose between the Deco Steps Necklace and Arrowhead Necklace. I would like to win the telescope necklace. That one is super cool Leslie! Not sure yet…I’d love a fun statement piece though! Their necklaces are my favorite!! I’m loving that camera strap and those warm socks! 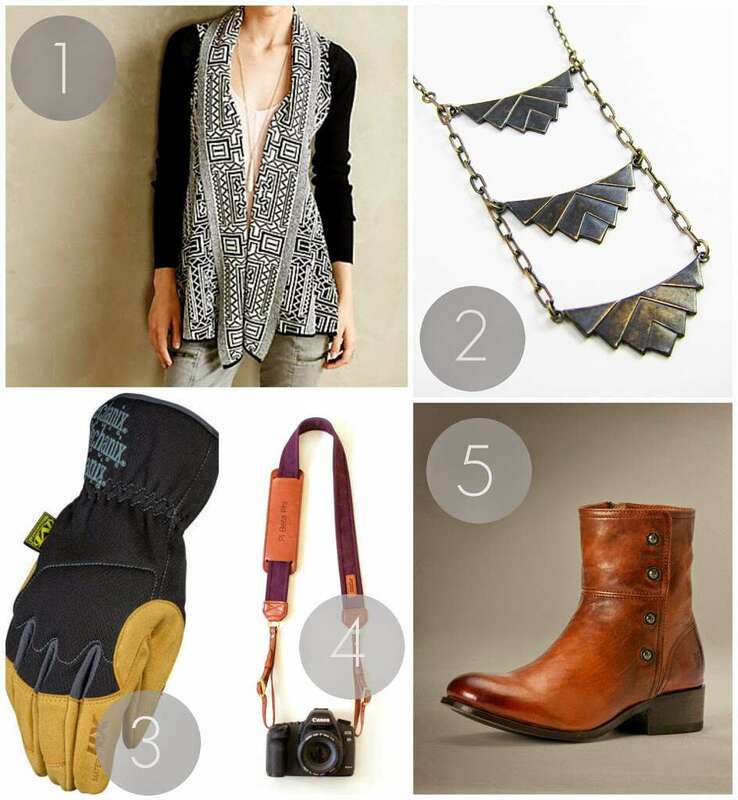 This is such a great gift guide! Think I would get the Shield and Mesh Wrap Bracelet. Ooooh, good choice Shirley! Love that mesh! Aren’t they just the coziest things?!? I really really want some! I like the bow bracelet. That one is awesome Linh! I like the Bird and Rhinestone Necklace!